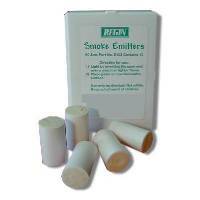 Regin Smoke Emitter Cartridges. Dense white smoke for air flow tests. In stock. Ships today! Dense white smoke for airflow and leak tests. Range of burn times and volumes. Regin® Smoke Emitter Cartridges produce a generous amount of smoke at a constant rate for easy identification and assessment of air flow patterns of HVAC systems and fume hoods. They consist of a small plastic cup into which the smoke generating compound is packed. The compound ignites when touched by a lit match or lighter. No flame is produced, only generous amounts of dense white smoke. The small smoke particle size--0.3 to 2.5 microns--is perfect for testing high efficiency filters and other air purifying equipment. The smoke is non-toxic, containing no zinc or oil—and leaves no residue! Extremely stable. Up to 3-years expected shelf life. Regin® Smoke Emitters are great for testing of all high, medium, and low pressure duct-work systems and air balancing procedures. The smoke emitted has the same density as air, so it is possible to observe true air movements. Ideal for checking HEPA filters. Regin® Smoke Emitters ship safely world-wide! 1/11/2010 – Hi, im from australia im wondering if this product is allowed to be sent to me. I have no idea on the legal or customs info . . .
12/29/2009 – What is the length and diameter of each cartridge?